By default, we are permitted to install any devices on a Windows computer if we have the right driver software. However, it is possible to prevent a hardware unit whether it is a PC part or external units like phones, camera etc if we change the default Group Policy enforced. 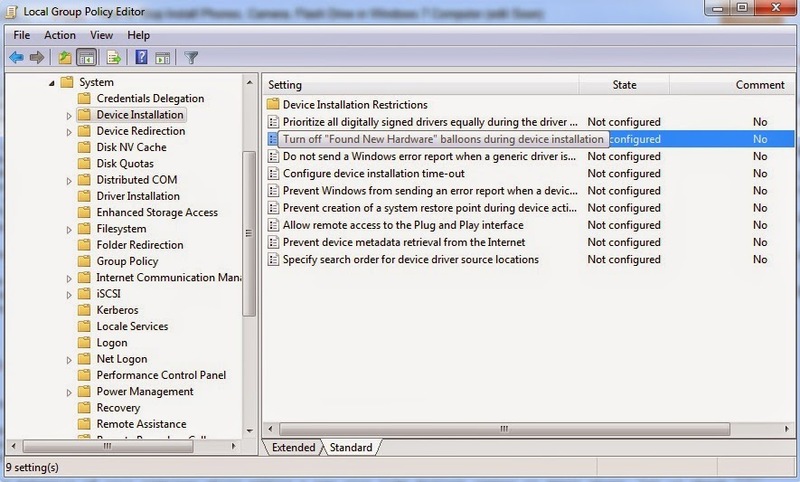 This tutorial explains various options to prevent the installation of external devices on a PC running on Microsoft Operating Systems. To continue the steps, it is important to log on to admin profile. 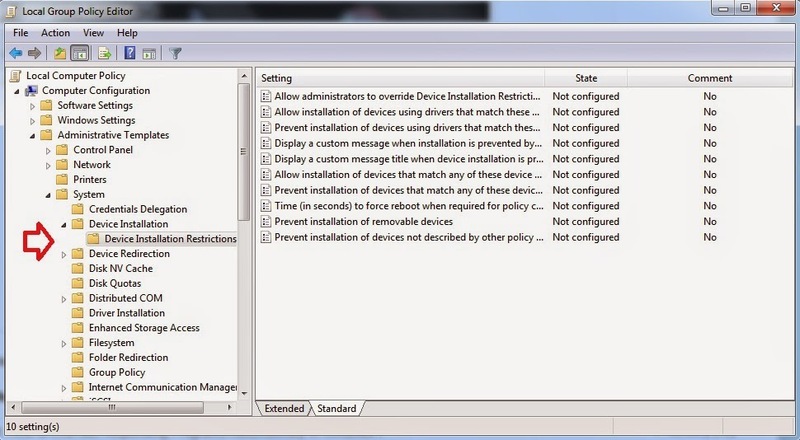 We can change the default Microsoft policy about adding hardware devices to a PC by accessing "Device Installation" in "Local Group Policy Editor". It is important to note that any wrong settings on Local Group Policy Editor can seriously affect the smooth working of your computer. So, follow the instructions written here carefully. 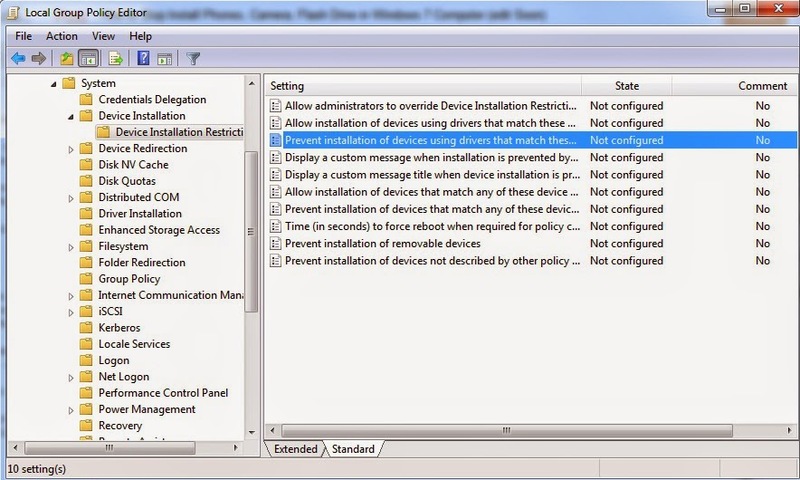 We can use "Device Installation Restrictions" feature under "Device Installation" to enforce the custom rules created by us to reject the external equipment by specifying their Unique Device Identifier (UDID). 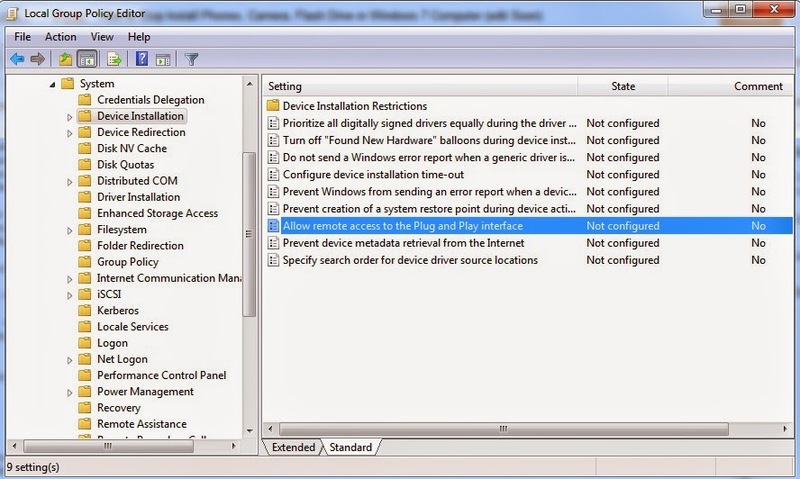 For example, if we add the UDID of a Smartphone on Device Installation Restriction, that phone will be rejected by the laptop while trying to connect it. Here you change the behavior of your computer while adding new equipment like a digital camera or smartphone. Let us check some of the tweaks we can do using these policies. By default when new hardware is detected, we will see a balloon saying "Found New Hardware". 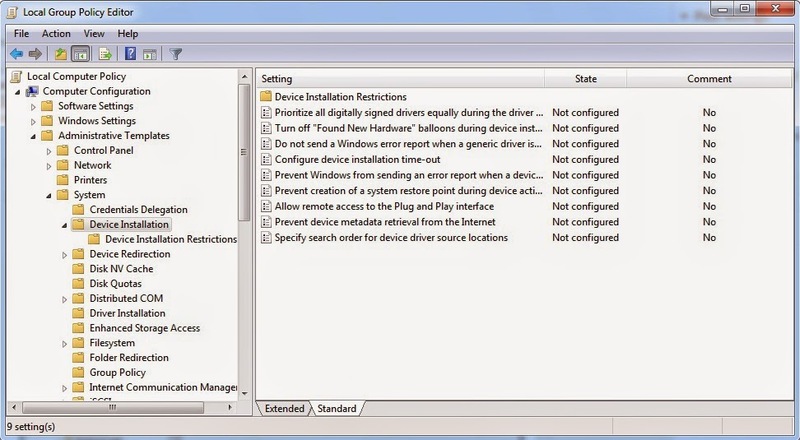 If you do not want to see this message while connecting a USB drive or Android phone, you can disable this balloon from the Turn off "Found New Hardware" balloons during device installation. Double click on it and select Enabled radio button. Do not forget to click apply. Now onwards, you will not see alert which says the presence of new equipment. Group Policy edit enables us to grant remote access to plug and play interfaces on your laptop. To grand your friend remote access to plug and play interface, double click on Allow remote access to the plug and play interface. Choose Enabled radio button and click apply. 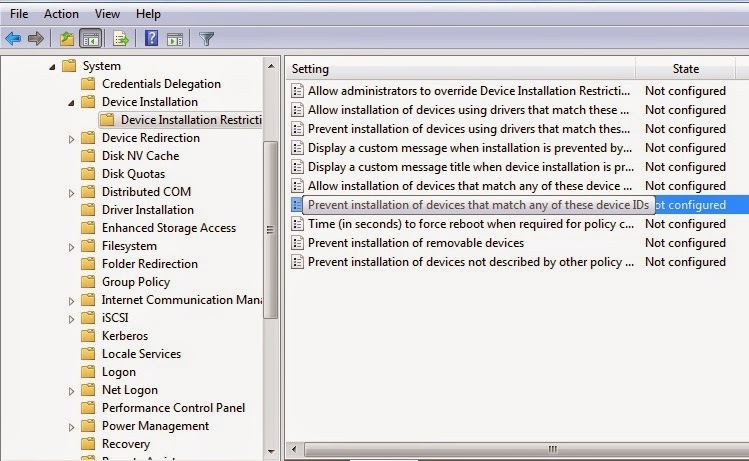 Here we can see various types of restrictions we can create to block hardware from getting added to the computer. Let us check each of them separately. We can block peripheral equipment like a flash memory stick or iPhone by blacklisting the driver. 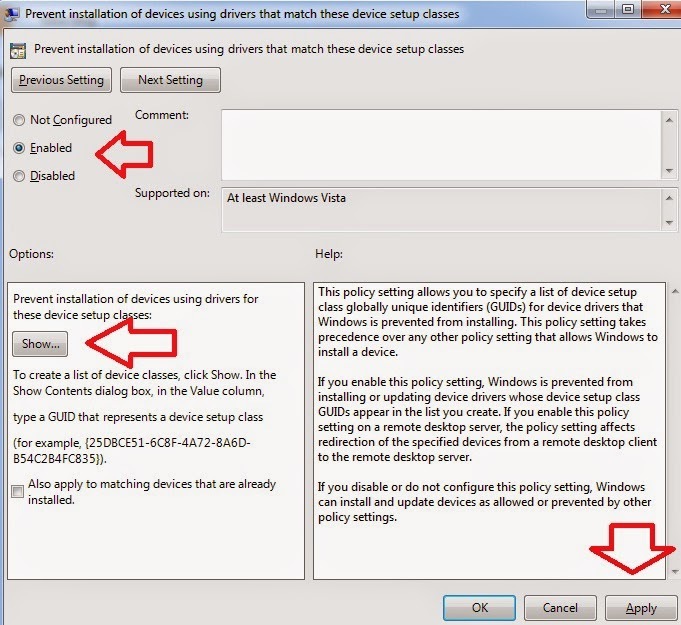 To use this feature, you must double click on Prevent installation of devices using drivers that match these device setup classes. Choose enabled and click on show button to operate it. Devices can be blocked from getting added to a laptop by using their IDs. To activate this policy, double click on Prevent installation of devices that match any of these device IDs. Choose enabled to activate this policy and use show button to add the UDID. If you add the UDID of a USB stick, it will not get detected by your PC. Can I Change UDID Of a Device? One of the readers of www.corenetworkz.com asked me if he can change the current Unique Device Identifier. According to various sources, it is possible to change the current UDID but those methods are different for different products. For example, we can use the following command to change the current UDID of an iPhone. Most people need jailbreak app to change the current one to a different one.